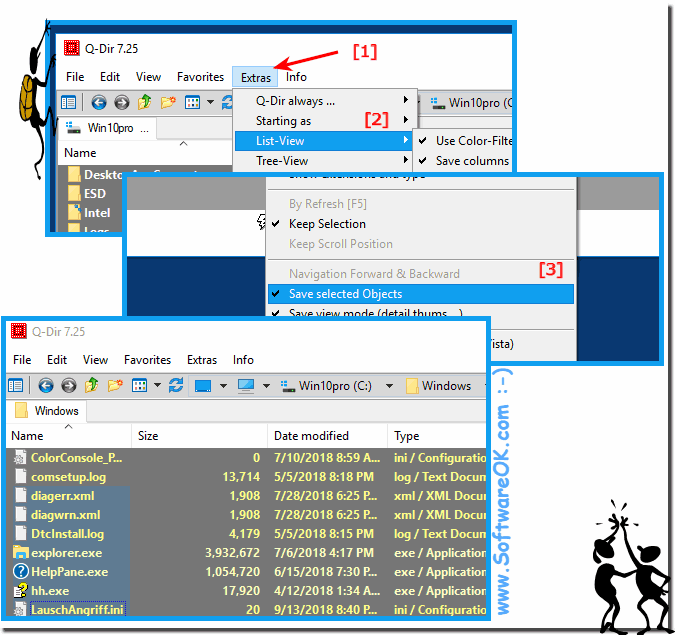 Here is the solution how to keep selected object in Explorer View, at back and forward navigation this solution is for Windows 10, 8.1, 7! Then it should work ;). Automatically highlight the original folder upon navigating backwards. (Image-1) Keep selected files at forward and back navigation! As you can see above in Windows 10 shot screenshot, this option allows you to mark the selected folder and files during navigation and continue to be marked. In Windows XP, this was standard in File Explorer, now in Win 10. However, you can easily use this solution on earlier versions of Microsoft's Windows operating systems, whether it's a Windows desktop, tablet, Surface Pro / Go, or even a server operating system. It's sometimes useful to unmark the selected folder and files while doing so the navigation forwards and backwards remain marked. Q-DIR - FAQ-11: Forward and back-navigation and keep selection of objects in all Explorer Views! Is there a way to choose the details you want shown for the files in the windows, like there is with Windows explorer? I am sorting and combining two huge bookmark lists and wanted to show date created and date modified before size and type in the columns. Windows Explorer lets you do this in it's view options but I didn't see anyplace in q-dir to do this. If there is a way to do this, please let me know. If no such way exists, that would be a really great thing to include next time, since when sorting photo files to edit for size so i can use them, I compare size and dimensions before date or other criteria. In the Options window, click the General tab. Click here "...Auto: like MS-Explorer"
Recently upgraded from Win7 to Win10. Now when I navigate forward with keyboard, Q-Dir deselects the tab. So if I rely completely on keyboard for navigation, after clicking 'Enter' on a folder, I would need to click Tab and Shift+Tab in order to select the tab for navigating with the keyboard. Navigating backward works fine, I guess it's because Q-Dir automatically highlight the original folder upon navigating backwards.